How much is my book worth? How do I donate my old books, newspapers, graphics, or manuscripts to AAS? How do I become a friend or member? What does the "mwa" in your e-mail addresses stand for? What does the motto on the AAS seal mean? Who can use the library and check out books? How do I become a reader at AAS? Is it possible to visit the library without becoming a reader? I am a student working on a paper for school. Can I use the library? I am doing genealogical research. What collections and services does AAS offer? How do I ask for the materials I want to see? Will I be able to photocopy from library materials? What are my imaging options for personal use? May I search the AAS catalog online before visiting the library? AAS cannot provide information on the valuation of books, manuscripts, or graphic arts. The link below will lead you to the American Library Association's succinct description answering many common questions about "Your Old Books" at www.rbms.info/yob.shtml. Thank you for considering donating items to AAS! Our collections have been augmented by almost 200 years of generous donations, and our curators are always excited about adding more gifts to their collections. If your item was printed prior to 1877 in what became the United States or Canada, chances are it is either a "have" or a "want" - anything we do not already have, we want! AAS also collects manuscript material such as family letters, diaries, or local institutional records, primarily from New England. To find out if your item is just what AAS has been looking for, please contact the appropriate curator listed below. Give them as much detailed information as possible describing what you have. The curator will determine whether it would make an appropriate addition to AAS's collections. As mentioned above, AAS cannot provide any information regarding the valuation of items. One other note: Please do not just leave an abandoned box of books on the doorstep. gift to sustain a vibrant present and ensure a strong future for the Society. Members, who now number more than a thousand persons, are elected by their colleagues in recognition of scholarship, for support of cultural institutions, for manifest interest in bibliographical matters, or for distinction as community or national leaders in humanistic affairs. What does the "mwa" in the Society's e-mail address stand for? The "mwa" in the American Antiquarian Society's e-mail address is the library's Union List of Serials and National Union Catalog code. It is shorthand for: Massachusetts Worcester American Antiquarian Society. The motto on the AAS seal is the whole of line 872 in Book XV of Ovid's Metamorphoses. Believe it or not, this question has come up more than once! 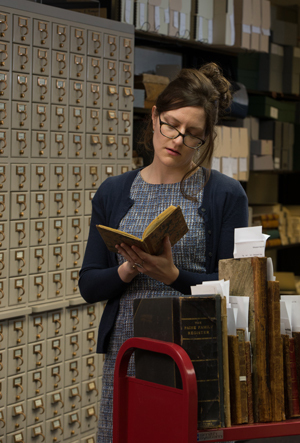 To clear up any confusion, we are the American Antiquarian Society. We are not an aquarium or "antiquarium" (whatever that may be). Antiquarians are interested in antiquities or antiques, primarily rare books. Consequently, the only fish we have are illustrations printed in early American books or graphic arts. Our name was given to us by our founder, Isaiah Thomas, in 1812. At that time it accurately reflected the society's holdings, which included Native American artifacts, canoes, etc. Early in the 20th century, the Society decided to focus its collections on printed materials. While the term "antiquarian" has taken on negative connotations in some circles, we believe it accurately represents the Society's heritage. The American Antiquarian Society is a research library. Experienced researchers who are working on specific projects that require the use of the collections may apply to use the library. Materials are consulted only in the library's reading room. Read more about planning your visit. The library is open, free of charge, to experienced researchers who are working on projects that require use of the collections. New readers must complete an application describing their research project and must have available two forms of identification (one bearing a photo, e.g., a driver's license or passport). As part of their orientation to the library, all new readers meet with a senior staff member to discuss their research interests and to review reading room policies. Undergraduate students over the age of 18 are welcome to use the library on the same terms as other readers. High school students generally do not need to use the library, but if one does show a genuine need and is approved, a parent or a teacher must accompany him or her. Free public tours of Antiquarian Hall, the Society's library building, are given every Wednesday afternoon at 3 o'clock. The tour lasts about one hour. Reservations are not necessary, but advance notice is required for groups of more than ten persons. The use of the library is free. I am doing genealogical research. What services and collections does AAS offer? The American Antiquarian Society has a very strong collection of published genealogical material focusing on early North American lines of descent, including French-Canadian genealogies. Not only is this collection used by genealogists but it is also used extensively by scholars working on biographical, historical, and literary topics. Currently, the collection numbers over 17,000 family histories, plus 2,000 genealogical reference works. The Local History collection at the American Antiquarian Society encompasses more than 55,000 volumes published between 1821 and the present. It is among the largest and most frequently used resources at the Society, and is the one collection that best reflects the Society's national scope, for it includes works of all fifty states and for thousands of their constituent counties and local communities. In order to derive maximum benefit from the Society's genealogical collections, readers are encouraged to do preliminary research before applying to use the Society's collections. For more information see our genealogy and our local, county, and state history pages. the reader in the reading room. Selected bibliographies, genealogical resources, and finding aids are available in the reading room. These may be consulted by readers directly. Books, newspapers, graphic arts or manuscripts can all be requested online. During the orientation interview guidance will be provided on how to find call numbers and where to turn in completed call slips at the reference desk. Some items cannot be photocopied, usually because they are oversized, extremely rare, or fragile. Many of our earliest books, newspapers, and ephemera are now available digitally or on microfilm. Print out from these sources rather than requesting photocopies of the originals. For items that are eligible for photocopying, readers fill out a photocopy request form available at the reference desk. All photocopying is done by AAS staff members. Photocopying is limited to 20 pages per reader per day and the charge for photocopying is 50 cents per page. Readers assume all responsibility for observing the legal requirements of copyright. Read more about rights and reproductions. Imaging options for personal use are fully described in the handout What are My Imaging Options?.For images that will be published in any form, you will need to sign a licensing agreement and additional fees may apply. More complete information is available on the rights and reporductions page.